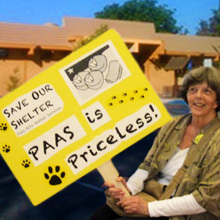 In 2003, my mother and I adopted two kittens from PAAS. We named them Hal and Grady. 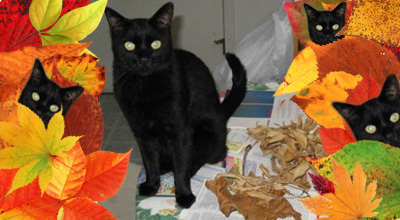 In 2006, Hal began a practice he continues to this day: during the night he picks up leaves (mostly dried & brown) and brings them home as gifts. He usually drops them on the kitchen floor. Hal’s leaves are selected and retrieved from our neighbors’ yards, from trees and shrubs we don’t have in our garden. That means he travels over 5-foot fences carrying the leaves and then brings them safely through our cat door. Dry, brittle leaves make it in one piece. In 2008 I spent six days in the hospital for back surgery. The first night I returned home, I slept in a downstairs “guest” room. All the animals were pleased at my return, of course. But after dark Hal went out of his way, bringing bunch after bunch of green leaves into the house and dropping them like a trail of breadcrumbs along the hall that leads from the kitchen to the bedroom where I slept. A tangible, verifiable “Welcome Home!” from a cat. The other thing Hal does as he’s returning with leaves is meow. He meows loudly and repeatedly, continuing even after he’s inside the house. 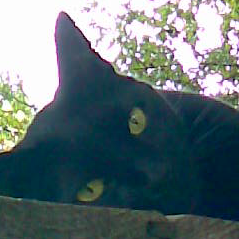 In summer with the windows open, I hear him and respond with a comparable “meow.” I think he appreciates the back & forth. Who knows what the neighbors think?